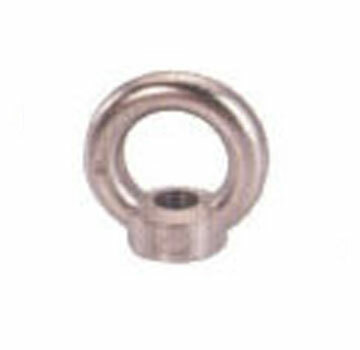 PRODUCT: #SSDN20 20MM FORGED STAINLESS STEEL METRIC EYE NUT. Price/ 10. Thead Type: Metric, See Pitch Info. Rated Capacity relates to the Eye Nut capacity. The capacity/strength of the attachment stud must be considered. See Safe Lifting Chart. All rated capacities consider a straight vertical lift. Use CAUTION when lifting. Any angle beyond vertical (zero degree) will reduce the rated capacity. Manufactured to European DIN standards.